Yeah, we know the Android Market is littered with twitter clients, but we have a new one for you today.Â A rather big name in the twitter game has arrived and its name is Seesmic.Â Already available for desktops, through the internet, and BlackBerry, the free application finds many of today’s popular twitter tools. Unfortunately, the lack of a widget in this release could be a dealbreaker for some Android users. Â This handy desktop feature helpsÂ keep an eye on timelines or fire off a quick tweet without the need to open an application.Â On the flip side, Seesmic has a decent sized fan base that could help them grab a share of the mobile space more quickly. 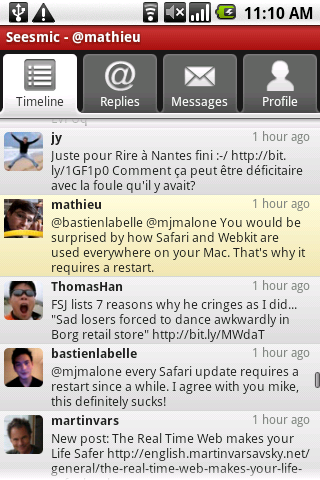 Fully featured: Seesmic for Android groups all your Twitter timelines in one simple screen. Whether you want to scroll infinitely in your friends timeline or want to find a private conversation with a friend, everything is one tap away in a beautiful interface. 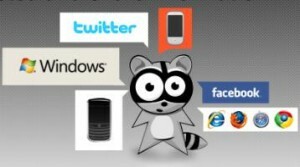 Share photos, videos and location: Share photos, videos and your location in your tweets, with the service you want. We included popular photos and videos sharing websites like yFrog, TwitPic and even Youtube. You can also automatically shorten URLs you type with Bit.ly, J.mp or Tinyurl. Be Notified: You can choose to be notified for what maters to you: all your tweets, your replies or your direct messages. Do you want to be alerted by a specific ringtone, or just by a discreet little light? No problem, you can configure to be notified for what you want and how you want. Tap any notification, and you are back in the Seesmic application. For videos of how Seesmic looks and feels, check out the following links.